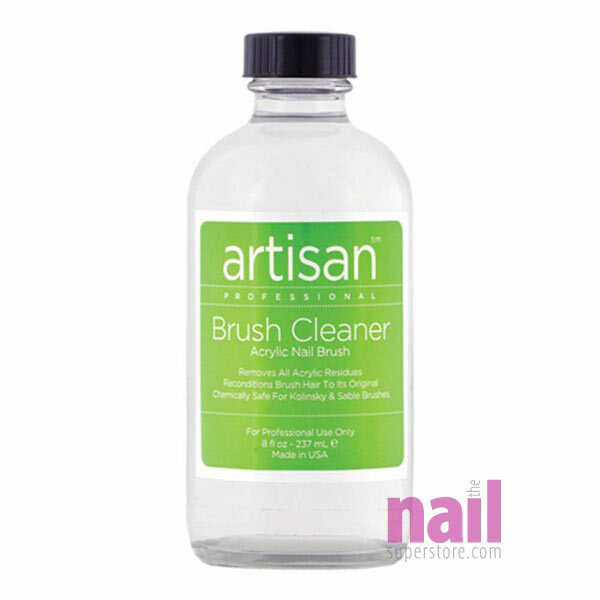 Artisan Acrylic Nail Brush Cleaner. It cleans great and preserves your brushes! Unique formula works excellent to quickly remove residue and build-up. Excellent for protecting your Kolinsky and sable nail brushes from harsh chemicals. Great for preserving your brushes and protecting your investment. Also check out our brush cleaner jars! Product Comment: This worked beautifully to clean my brush for acrylic nails. It's like new. I'm also an artist and wondering if it's good for acrylic paint and/or oil paint. May give it a go and find out. Product Comment: Exactly as described. One of the best brush cleaning formulas I’ve used. Keeps my brushes looking brand new. Great price for the quantity. Fast shipping! Great customer service. Product Comment: Absolutely love this product, the size is huge and will definitely last me a very long time. The liquid is great for cleaning my acrylic brushes, nail art brushes and gel brushes. I really love how the product gets out any and all product from my brush. I put this in a small dappen dish while I do nails too dip my brush in when I feel it has gotten dirty. I use this before, during and after doing nails. It works amazing and I highly recommend artesian has the best products! Product Comment: Works really, really well. My brushes were hard as hell from acrylic and it got them back to brand new. I will definitely be purchasing again and again!!! Product Comment: I'm almost out of this product. I use it all the time. It definitely takes out all acrylic and gel residue. Leaves your brushes clean and in they take on their original shape one your squeeze out the excess fluid. Leaves them fresh for the next use. Product Comment: I use this product after I finish applying acrylic on my nails. I love this cleaner! It works wonderfully getting all of the acrylic off of my brush and definitely keeps the bristles conditioned. I think my brush is going to be around for a while only because of how great this cleaner works. Product Comment: I am in love with Nail Superstore. They have nice products for affordable prices! Product Comment: Didn't think I'd need this product but I am so glad I bought it! Sometimes the acrylic will dry fast in the brush and if you just dip the brush in this cleaner and leave it for 1-2 mins you can wipe it on a paper towel to get the excess liquid off. It does condition the brush back to its normal shape so any fly-aways will be fixed. I really like this product. Product Comment: The cleaner seems to keep my brush nice and clean from getting all gummed up from the acrylic. Product Comment: I was very pleased with the product. The scent is very strong and a bit unpleasant but it does an excellent job.